Body awareness connects you with your innermost self allowing your body to identify and correct problems. Through the mind and body connection, you will discover how to improve movements and remove limitations in mobility. With enhanced awareness, you can learn how to let the body heal itself and keep it healthy and injury free. When we experience pain such as a stressed muscle during a run, we often resist the sensation and turn our attention away from the area. We try to ignore the signals that our body is sending to us. If we create resistance, the condition usually gets worse and develops into an injury. However, if we give our full non-judgmental awareness to our body and the source of our pain or ache, the body is able to respond and change to meet its own needs avoiding the necessity to send further signals. Acceptance of how your body is feeling rather than rejecting the running pain activates positive energy and promotes healing. I have practiced this many times while running and I have enjoyed its healing benefits quite often. Sometimes it may be necessary to repeat the process. 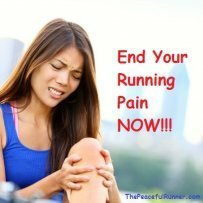 Just continue to give that area of your body your full attention until the pain or discomfort goes away so you can continue to run injury-free! There is a strong connection between the mind and body. Increasing your awareness will develop and strengthen this connection, proving to be beneficial physically, emotionally and spiritually. Awareness promotes living in the present moment, rather than focusing on the past or the future. As runners, we know how detrimental it can be to focus on the distance remaining to run rather than on how much we are enjoying the run and how great we are feeling right now. As we develop and practice our awareness, we become more mindful of our bodies as we learn to live and run in this moment. Developing awareness of the body improves concentration and will help you learn How to Relax. You will become aware of areas of your body that are tense and you will be able to consciously relax them. A relaxed runner is a happy, injury-free runner. 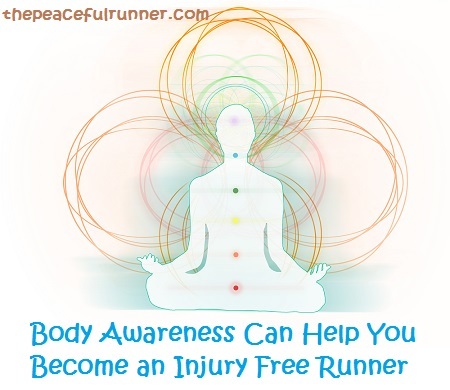 With awareness practice your running will become pain-free. You will learn how to utilize your energy more effectively and you will run more efficiently. You will feel an overall sense of well-being as you become more in tune with your inner-self. The following video, which is a short guided body awareness meditation, will help you practice awareness at home. 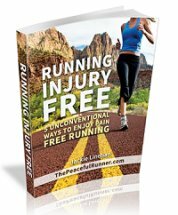 To learn more about how to improve your awarness of how your body moves, download our free book: Running Injury Free: 5 Unconventional Ways to Enjoy Pain Free Running. 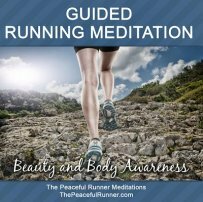 If you would like to practice a guided body awareness meditation while running, try our Guided Running Meditation: Beauty and Body Awareness. There is a variety of methods that exist today that we can use to develop awareness of our bodies. One that I practice and have had much success with is the Feldenkrais Method. This method teaches awareness through whole-body movements and proves that it is possible to heal chronic injuries. Barefoot Running also increases awareness of the body. Runners receive instant biofeedback through the feet increasing awareness of how their body moves. They focus more—developing a stronger mind and body connection. The body reacts naturally and barefoot runners instinctively run softer on the forefoot.